There you are, walking, riding a bus, playing with a pet, or perhaps beginning to fall asleep in bed, and you think of a word that needs changing, an idea to insert, a cut to make in what you've been writing. Your pen is handy. You jot the thought down. If necessary, write a word or two on your arm. That's why A WRITER ALWAYS HAS A PEN! As a kid I never consciously wanted to be a writer, but some factors in my life helped lead me in that direction. I grew up in an isolated country home, and had few nearby playmates. So I read a lot and had a rich interior life (lots of daydreaming, imagining, and entertaining myself without people around). Alone, but not feeling lonely--a valuable characteristic for a writer! In high school I was not good at sports, was not one of the "in" crowd, and read a lot. At 16 I had a short nonfiction piece published in a boy's magazine. And was paid $5 for it! (This was long ago, $5 then would be like $25 these days.) However, this didn't make me feel that I was on a path toward being an author. Nevertheless, a thin thread of writing, and wanting to be a writer, ran through my life. For college I considered majoring in either journalism or wildlife biology. I chose the latter. At Cornell University I took a course in writing for magazines. Then, and later, as a graduate student, I submitted nonfiction articles to magazines. A few were published. (Some of the magazines didn't even pay, but they had readers and I was getting published!) A key turning point occurred when I dropped out of a Ph.D. program, giving up my dream of being a wildlife researcher or professor. This felt like disaster--for a while. But it was just a turning point that sent me in a wonderful direction. I took some journalism courses and learned enough to earn a job as a rookie editor at Nature and Science, a children's magazine published at the American Museum of Natural History in New York City. This was extraordinary serendipity (I love that word!). I had never written for young readers but the magazine was for kids. Eager for ANY writing job, I landed one that just happened to involve writing for young people. I began to learn about that kind of writing. The magazine ceased publication after seven years, but by then I had begun to write books. And by then I was inspired because I believed that writing for children is more important than writing for adults. A FUNNY THING HAPPENED: Part of the fun of my job is meeting wildlife biologists, and also going to wild places to observe wildlife, and sometimes take pictures of them. I've written about wolves, sharks, poisonous snakes, scorpions, and other creatures that some people think are dangerous. So, I'm asked: "Have you ever been hurt while doing research?" Yes, just once. I was alone in the southern Arizona desert, and I wanted pictures of a rattlesnake to have in my book The Gentle Desert. I turned over a chunk of dead cactus, and there were two rattlers. With delight I began taking pictures. I moved around, trying to get close for good pictures--but not too close. All the time I wondered: "Hmm, could there be more rattlesnakes nearby?" At one point I backed away from the rattler in front of me, and felt a sharp pain in my rear end! For a split second I thought I had been bitten. Instead, I had backed into a cactus. In 2017 my 117th book was published. I'm thrilled, and also proud because each of those books took a lot of hard work. My books have been praised for their high quality--by reviewers, teachers, librarians, scientists, and by the children and young adults who read them. It feels great to know that the Chicago Tribune called me "one of America's top nonfiction writers for young people," with "a remarkable ability to succeed with topics others would turn deadly dull." A reviewer for the American Library Association's Booklist called me "an esteemed children's author whose gift is turning natural history and science into page-turning reading." 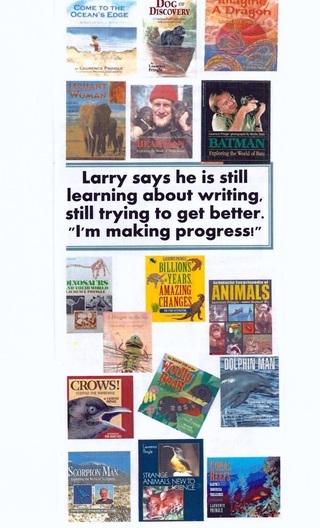 Also, in addition to rave reviews for individual books, I have received major awards from the National Wildlife Federation, the American Nature Study Society, the Washington Post/Children's Book Guild, and the American Association for the Advancement of Science. On the average day, however, I'm just a guy who often struggles to write a good sentence. For me, writing is hard work, and I have plenty of interests that lure me away from it. I have a wonderful wife, five grown children, and a house (or, as Zorba the Greek, a movie character of long ago, called this situation, "the full catastrophe!"). I still love being outdoors, whether working in flower and vegetable gardens, splitting firewood, fighting an invasive Asian plant called mile-a-minute vine, taking nature photographs, digging ponds for frogs and other aquatic creatures, or fishing at the ocean's edge. And then, inspired by nature, I try to write some more! One author I admire is Judith Viorst. She has written for both adults and children. She has written poetry, fiction, and nonfiction. Here is how she explained her writing success: "I always credited my mother with inspiring me to be a writer because she was such a passionate reader. She read poetry to me as a child. But rather late in life, I've come to appreciate my father, an accountant. He was a solid, organized, get-the-job-done kind of person--and you need that piece of it to be a writer, too. You need both a poet and an accountant in your soul." If you ask ten authors how they arrived at their careers, you might be ten different stories. Some people dream of such a life early. Every year I meet some school students who vow that they will become authors. I often wonder how that works out. Nearly every one has made important first steps--reading a lot, and doing some writing that goes beyond whatever is required in school. Those steps are vital. Reading helps your vocabulary grow (that's a fancy word for the collection of words that you know and use). When you read a lot you encounter many voices and styles--this can help you discover or develop yours. Also, you will notice that good writing often has a rhythm, for example, a mix of sentence lengths, with a short one right after a few longer ones. Readers like a mix, not endless long sentence after long sentence. Try to get published, and by that I do not mean paying a lot of money to produce a few copies of a book you wrote and illustrated. This can be done, but it is not the same as having an editor judge that your writing is good enough to actually appear in a magazine. or be made into a book, which can be sold to the public. In some middle schools and high schools there are opportunities to have writing (fiction, nonfiction, poetry) published in school publications. If you dream of being a famous author these may seem like baby steps, but they are vital. Inside, your confidence as a writer grows. You are making progress. And you gain credibility with editors when and if you try to get published elsewhere. Most successful authors did not start right off with a book. Many first work hard to get something published in a magazine, newspaper, or certain internet web sites. And, remember, being a book author is just one of many possible writing careers. Think of all of the places in our lives where writing is involved: advertising, journalism, scripts for TV and films, magazines and newspapers, the whole internet. (I know one woman who writes consumer information for drug companies and health organizations. Her name as an author is little known. She seldom gets a "by line," BUT has had a long, successful career as a writer.) There are many kinds of writing careers to aim for. Also, even if you never get published, just being a person who can write in a strong, clear way is a great skill, and can help in variety of jobs. Your Life Before You Were Born because I was fascinated by that time--about nine months long--when every human is an aquatic mammal. A baby develops inside its mother's womb, or uterus, that is filled with water. We can't breathe underwater, but get oxygen and food through a cord that attaches at the belly. The cord is cut when we are born, and we are left with that little mark, called the bellybutton, where it was attached. All of our lives our bellybuttons can remind us of that unusual stage of life. One day I mentioned this book to an audience. Afterwards, a woman rushed up to talk to me. She announced, "I don't have a bellybutton!" She opened her clothes a bit to show me. Instead of a bellybutton, she had a long, vertical scar. She explained: when she was an infant, she had major surgery and lost her bellybutton. Her parents were worried that other children would make fun of her odd-looking tummy. So they told she had something much better than a bellybutton. She had a belly zipper!